¶ 1 Leave a comment on paragraph 1 0 A new era in commemorative stamps began in 1920 with the Pilgrim Tercentenary, as the variety of commemorative subjects expanded beyond promotions of world’s fairs to include significant anniversaries, military victories, and heroic individuals. 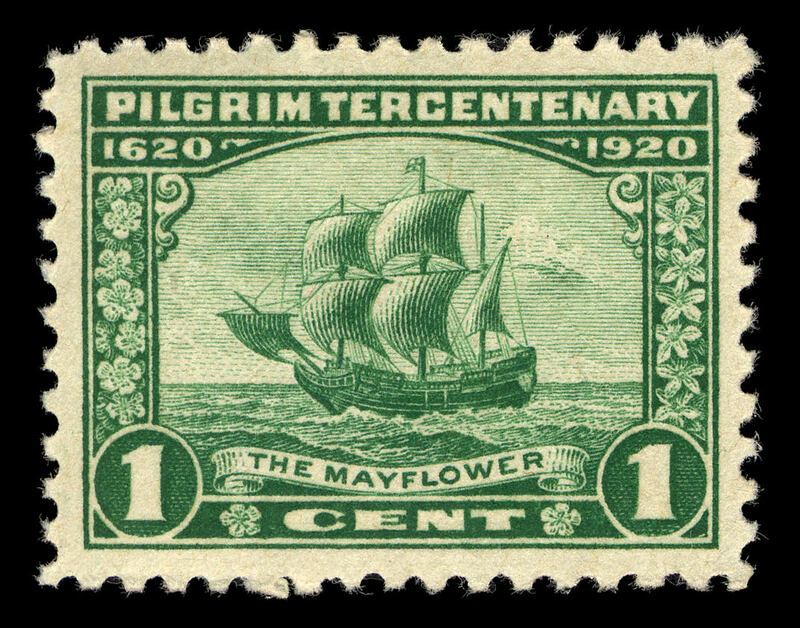 The Pilgrim Tercentennial celebrated the landing of religious separatists on Cape Cod and their eventual settlement in the town of Plymouth, Massachusetts. From December 1920 through the summer of 1921, towns in many states organized pageants and parades to commemorate this anniversary. 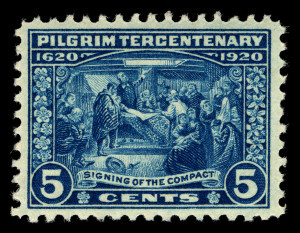 The stamp series created for this event was not the first to represent America’s founding mythologies (see the Columbians, 1892-93, and the Jamestown Tercentennial Exposition,1907); the series was significant because it sparked interest from many citizens to ask the USPOD to highlight their community’s history and connections to America’s origins on stamps.1 As a reflection of contemporary politics, elected officials and patriotic-hereditary groups invoked the legacy of Plymouth pilgrims both to assert the primacy of Plymouth as America’s birth place, and to speak to local and national anxiety over immigration in the 1920s. 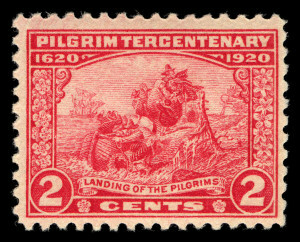 ¶ 8 Leave a comment on paragraph 8 0 Similar to the Columbians, the landing occurs in the 2-cent stamp–the most commonly-used stamp to mail a letter and remained the standard rate of first-class postage until 1932.6 This stamp’s engraving makes the landing look harsh, unexpected, and jolting for the party at Plymouth Rock. Men, women, and children huddled together illustrating that family units migrated to the New England coast. Although this image suggests that struggles lie ahead for the settlers, the rock is what grounded the travelers, and is the object that grounded those celebrating the anniversary in the past. 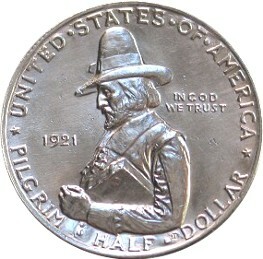 Plymouth was the ceremonial ground in 1920 and provided the physical connection to the past events. 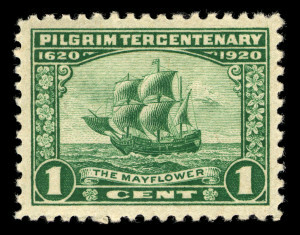 ¶ 10 Leave a comment on paragraph 10 0 The journey’s symbolic end revealed itself in the 5-cent where the Mayflower Compact was signed indicating permanence, and showed the first document of self-governance in what would become the United States. Copies of the Compact were printed and distributed for the Tercentenary. Divine right blessed this settlement as the central figure pointed towards the light illuminating the signing. 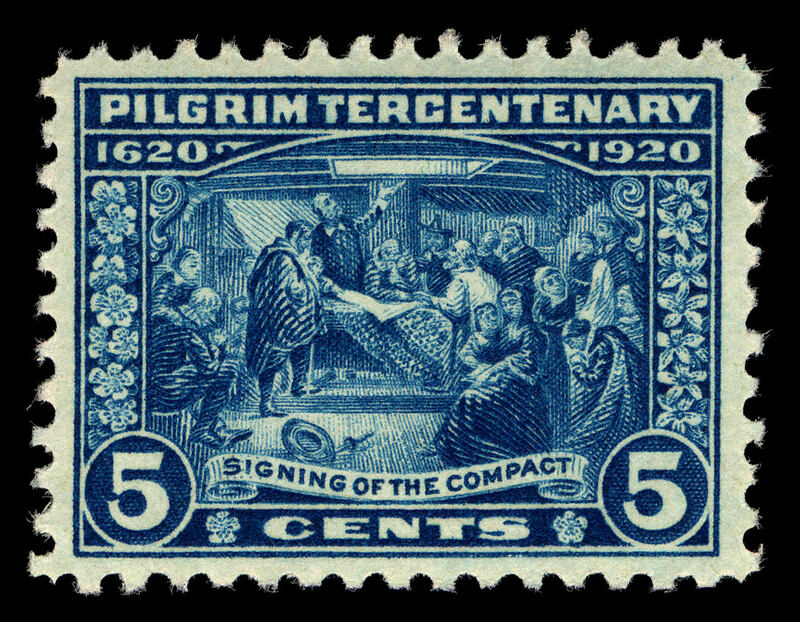 Drawn from a painting by Edwin White, the signing image illustrates families migrating together even though only men signed the document.7 The scene emphasizes that there was a community, comprised of family units, who crafted the Mayflower Compact and pledged to work together. 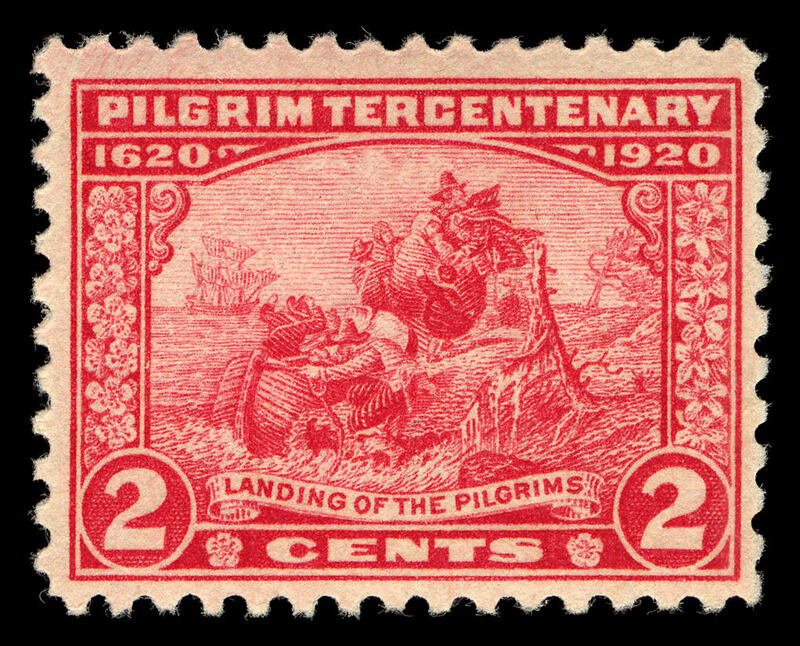 ¶ 12 Leave a comment on paragraph 12 0 At the time of the anniversary, New England preservationists and genealogists argued that the Plymouth pilgrims were the true first Americans because family units arrived together to form a permanent settlement through signing the Compact, unlike the commercially-mind individuals who sailed to Jamestown. By representing this scene, the Tercentennial committee reiterated their argument and wanted all Americans to consider Plymouth as the birthplace of the America. ¶ 14 Leave a comment on paragraph 14 0 Rivalries die hard, and Virginians did not let the Pilgrim Tercentenary pass without reminding Americans of their claim to the origins and contributions to American politics and governance. One address given at the College of William and Mary noted that Virginia’s contributions to the forming of the United States were far greater than any other state, but that Massachusetts came in second place. During the national celebration of the New England pilgrims, this effort reminded Americans that the “first” settlement was at Jamestown.9 No one at this time, recognized other colonial settlements in the western U.S. or acknowledged that the original residents of “America” were native peoples who were displaced, attacked, manipulated, and feared by European colonizers. ¶ 15 Leave a comment on paragraph 15 0 Virginians and New Englanders weren’t the only ones wrestling over founding stories publicly, through representation on stamps, as descendants from other European “pilgrims” argued successfully for their stories to be told on commemoratives.